The number eight tram rolls a good route. At least I think so. Starting in Largo di Torre Argentina, it cuts straight and then crosses the bridge, runs the entire length of Viale Trastevere before curving its way along Gianicolense and sliding into the terminus at Casaletto. On a good day; clear and avoiding the rush, top to tail takes about 22 minutes. On a bad day; rain and rush, it takes 35. I don’t very often top to tail or tail to top on the number eight. Most days I’ll ride a section though: The Ministry of Education up to work at the children’s theatre, the theatre up to the park, purveyors of fine pizza bianca back to The Ministry, my biscuit shop up to Stazione Trastevere. Come to think of it, of all my routes – there are many, I’m both dedicated and dependent on the exasperating Roman public transport system – this is the one I ride the most. Then every so often, last Saturday for example, we roll the whole line and are not only reminded what good curved cut the N° 8 makes through the city, but what a good destination awaits at the end of the line. Occupying the ground floor of a nondescript modern building just yards from the tram terminus and identifiable only by a small yellow sign, the trattoria Cesare al Casaletto is, from the outside, unremarkable. I’d passed by, at first oblivious and then dismissive, dozens and dozens of times. Then, on advice from Katie, we went for lunch. The best lunch we’d had in a long time. And so we went back, again and again, each visit reaffirming our conviction. Bright and luminous, da Cesare is the antitheses of the archetypal shadowy and surly Roman Trattoria – I should add I like shadowy and surly from time to time. It’s quietly elegant yet cordial and comfortable. On Saturday we were given a table in the nicest corner with plenty of space for a high chair. Da Cesare is a family trattoria in the truest sense and this is personified by the owner’s bold little girl who marches up to your table to say ciao. To start, we divided a portion of plump, preserved anchovies: oily, fiendishly fishy filets to be squashed onto bread and polpette di bollito misto; delicate, fragile, deep-fried spheres of breaded shredded veal served with a spoonful of pesto. Then we shared a primo of fresh egg pasta with vignarola (braised artichokes, peas, broad beans and spring onions) and pecorino romano cheese. We paused. For secondo my companion had baccalà alla Romana (salt cod with tomatoes) and I had involtini al sugo, two quietly delicious beef rolls in a rich tomato sauce. There were also side dishes, one a tangle of dark-green ragged cicioria ripassata and another of chips. Such good chips. 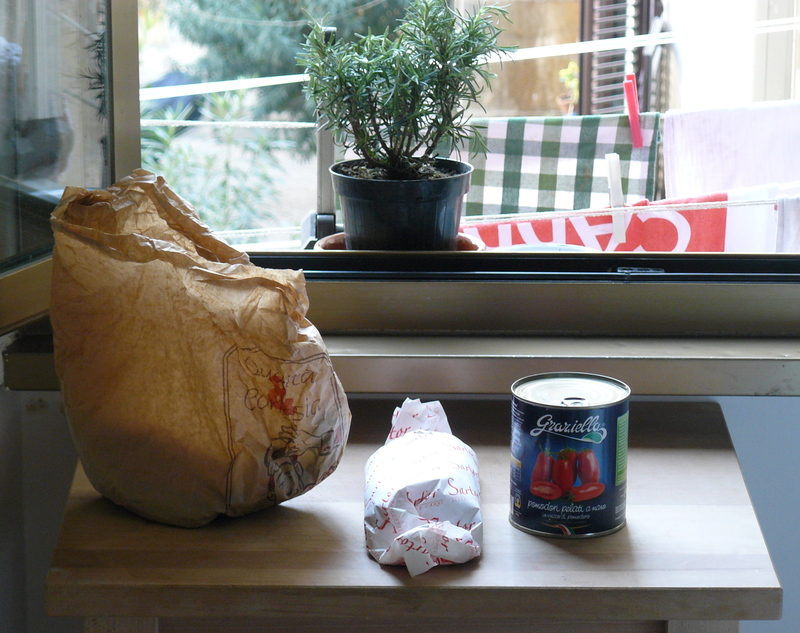 We finished with coffee and biscuits that had not long been pulled from the oven. It took me a few visits to understand what makes the Food at da Cesare so special. Of course it’s the excellent ingredients, the skill and a lightness of touch that transforms traditional Roman food – the menu is much the same as any menu you might find in any trattoria – into something so vital and impressive. Then, after the fourth or fifth meal, I understood. It’s the care taken that sets da Cesare apart. Real care without pretense or fuss, without swagger or caricature. The food makes even more sense when you talk to the owner, Leonardo Vignoli or his wife. Both are gentle, modest, passionate, attentive: a rare combination in Rome. The wine list is as splendid as the food. As is the advice to help you navigate it. As I paid the bill I asked Leonardo about the involtini, the two unassuming beef rolls that had been simmered tenderly in tomato sauce, maybe the nicest I have ever eaten (and I have eaten a few.) ‘Thin slices of good beef, well seasoned with salt, pepper and garlic wrapped around impossibly thin batons of carrot and celery and then simmered gently in tomato for an hour and a half‘ was his advice. ‘How would I know they were done?’ I asked. ‘Touch and taste‘ was his reply. Then he was gone – politely of course – back into the kitchen and I was left with a queue of questions trailing down my throat. My first attempt was acceptable. My second very reasonable. My third attempt at involtini however, was a resounding success. Not quite reaching the benchmark set by Da Cesare, but nearly. Ask your butcher to cut you 10 thin slices of beef – rump or chuck is ideal. Season the slices prudently with fine salt, freshly ground black pepper and very finely chopped garlic if you so wish (I don’t.) Position a fat bundle of painfully thin carrot and celery batons at the bottom of the slice and then roll, tuck and roll until you have a neat parcel. Secure the roll lengthways with a toothpick. You brown your involtini in hot oil, nudging and turning, until they are evenly coloured and then you cover them with wine and tomato and simmer for a good long while. The tomato reduces into a dense, flavoursome sauce and the beef rolls – with their neat bundle of savory – are simmered into tenderness. I wouldn’t have given these involtini a thought (never mind a second glance) before coming to live in Rome. Old-fashioned, boring and just damn fuddy-duddy I might have mumbled. Little did I know. 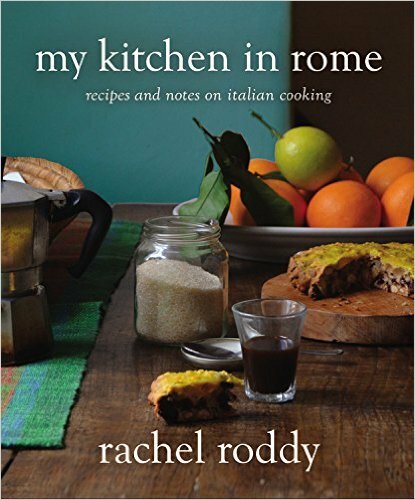 Made carefully with good ingredients, they are simply delicious, richly favoured and well, very Roman. And the word involtini? It comes form the verb avvolgere (to wrap) so literally translated means, a little thing that has been wrapped. Of course involtini work well as part of a Roman-style lunch. That is; a tasty antipasti, a modest portion of pasta and then a roll (or two) served alone on a white plate with nothing more than a crust of bread to scoop up the sauce. They are also good in a more English manner, that is beside a pile of extremely buttery mashed potato (what isn’t?) Roll with it. 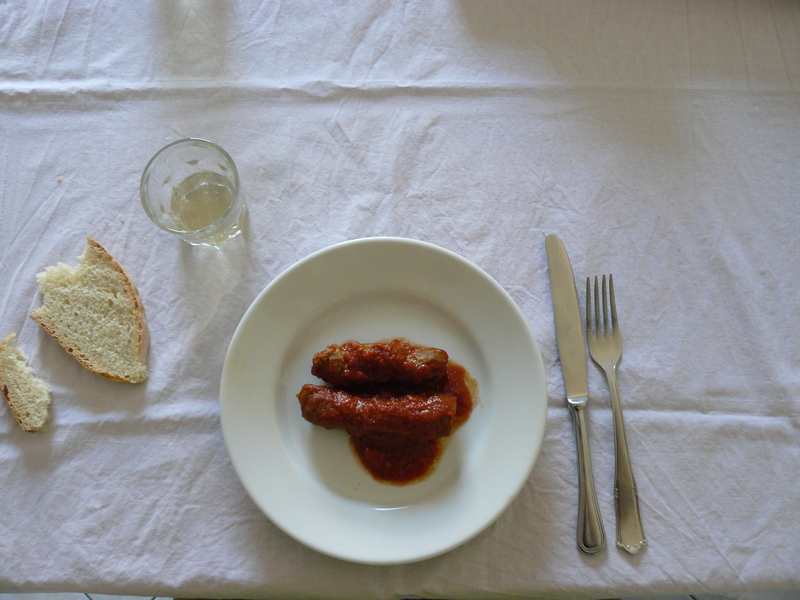 Inspired by the involtini at Cesare al Casaletto with advice from my butchers at Sartor. 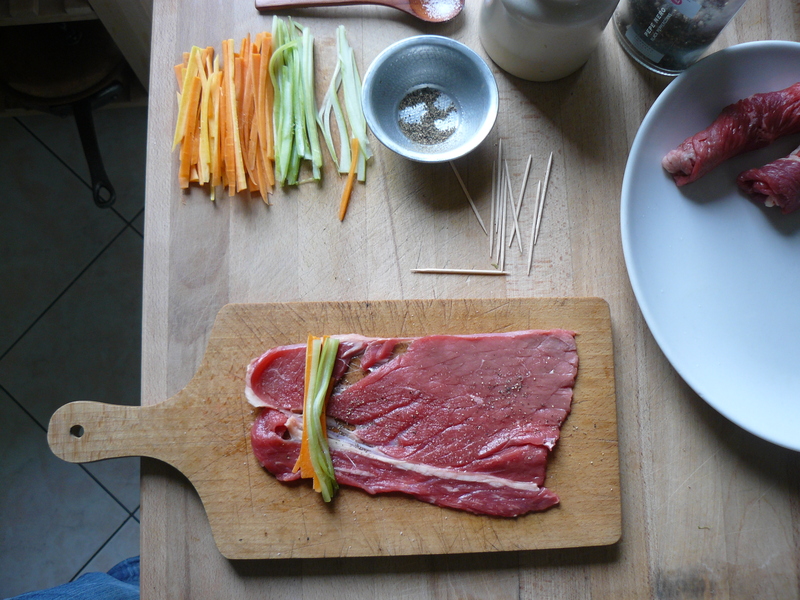 Peel and then cut the carrot and celery into extremely thin batons roughly the same length as the beef slice is wide. Take a slice of beef, lay it flat on the work surface, season with salt, pepper and very finely chopped garlic if you are using it. Again, I don’t use garlic. Place a bundle of carrot and celery at the bottom of the beef slice and then roll the beef around the batons, tucking the sides in if you can, until you have a neat cylinder. Secure the roll with a toothpick along its length. Warm the olive oil in a heavy based saute pan. 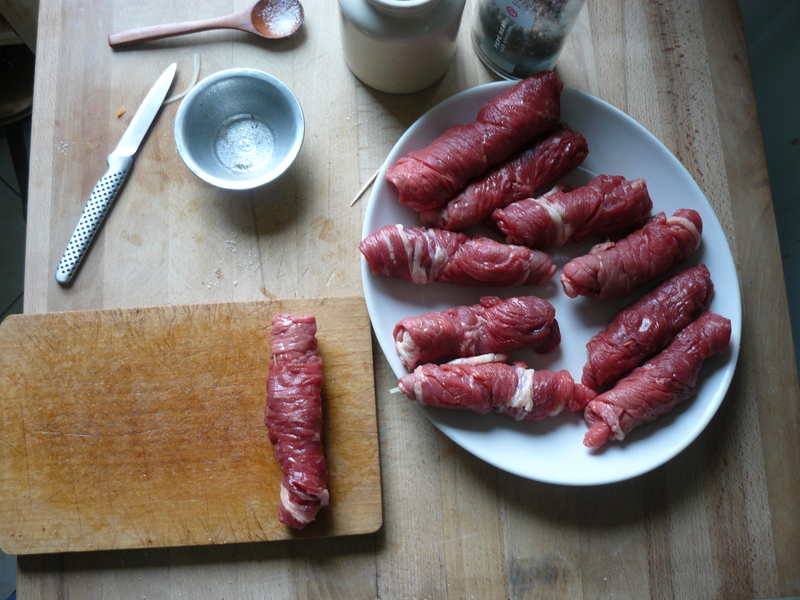 Add beef rolls, and cook, turning as needed, until browned on all sides, which will take about 6 minutes. Add the glass of wine to the pan, raise the heat so the wine sizzles and evaporates. Add the tomatoes and stirring and nudging the rolls so they are evenly spaced and well coated with tomato. Bring to a boil, and then reduce the heat to medium-low. Cook the rolls covered partially – gently stirring and turning the rolls a couple of times – until meat is cooked through and tender which will take about 1 and a half – 2 hours. Add a little more wine or water if the sauce seems to be drying out during the cooking. Lets the rolls rest for at least 15 minutes before serving with a spoonful of sauce and some bread. I am too; Cesare’s are particularly good. 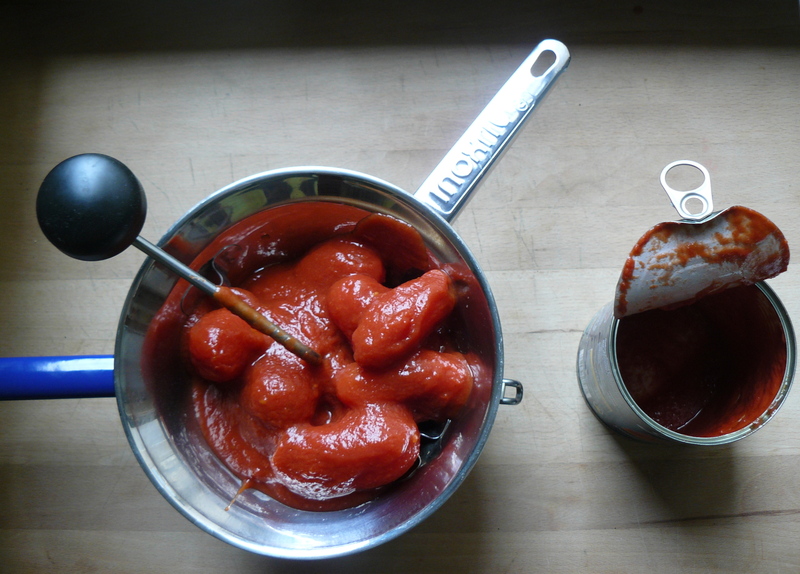 As pasta sauce – why Didn’t I think of that? Next time. Roll your way to rolls at Cesare. I’ve never left a comment before but feel moved to do so as you are so very inspirational. I will be going to my butcher today to persuade him to cut the beef so very thin. I agree – I found this post so splendid. HI Iona, that is so nice to hear. I hope your butcher is obliging. Happy rolling. I don’t think I’ve ever heard or tried involtini. But reading your post has made me incredibly hungry for some plus it looks easy enough to make as long as you pay attention to the detail. Reading this before lunch wasn’t really a good idea, was it? Bizarro coincidence. Despite spending so much time in Italy I have never had, or indeed heard of, involtini but last Sunday found them on a menu at a pub in Goudhurst. Jed had them and loved them and so I said I would try to find a recipe. Lo and behold his fairy Godmother has come up trumps. Am off to the butcher now. Thank you. Always happy to be part of your kitchen whirl, Just wish I was sitting in it with an extremely large glass of alcohol in my hand. these look great! i’ve never had involtini but am very excited to make them now. Just lovely. I love the recipes put together by brief instructions, passed on orally, to be remembered and acted out later a little like Chinese whispers. Seems like such a traditional way to cook a recipe. And you end up putting your own stamp on it. Per forza. Almost every post your write makes me wish I lived in Rome, but this one especially so. The involtini look very good, and that tram route sounds very nice. From cabbage rolls to involtini to what next, perchance? Your rolled and stuffed offerings resonate with me, so thanks again. The slices of beef – cut across the grain or with the grain? I need somewhere to organise my recipes too. talking of which my index is a shambles – sorry. You are really kind and it is lovely to have you reading along. Oooo you are a magical writer, Rachel! I can’t wait to try my hand at Roman involtini. 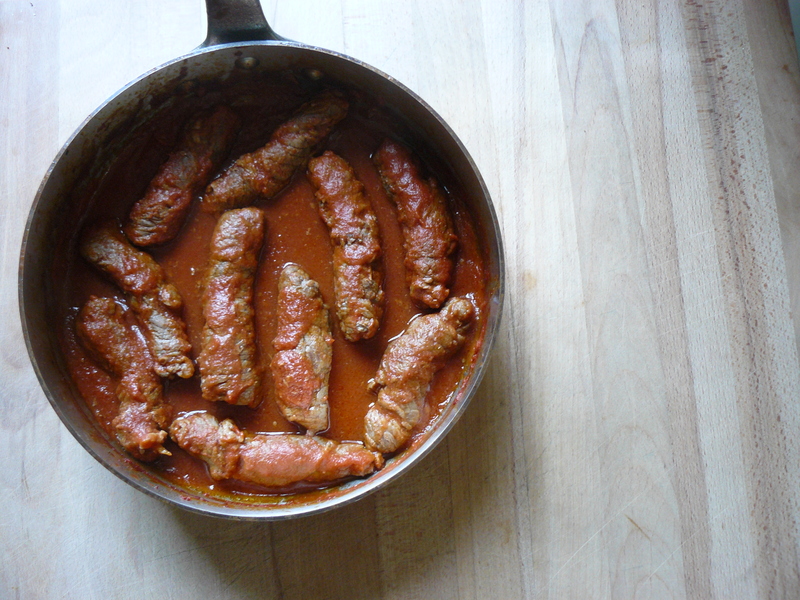 Our (Sicilian) household has heretofore been completely loyal to the type of involtini you’ll find near Mt. Etna, but I plan to show this to my husband and demand we make a little trek north for some Roman goodness. Thanks for a lovely read on a dismal Friday afternoon in NYC! Thanks so much. I like the sound of the Sicilian involtini – a recipe? From what I’ve gleaned from peeping over the counter, the main differences are he (and his town on the eastern coast) use either swordfish or veal instead of beef, and the filling (and also crust) is a mixture of parsley, garlic, pecorino, pistachio, and sometimes pinenuts/raisins. And always seared in the pain, sometimes with a tomato sauce, but just as often without. This looks so delicious that I have now made it twice. The sauce is DELICIOUS ( I guess the combination of meat, tomatoes, carrots and the celery is glorious), but my meat was tough both times. Any suggestions? Do you think I didn’t have thin enough slices? The second time I made it with slices the butcher cut for me from a prime beef rump roast. I am determined to get it right. Perhaps the third time will be a charm for me too. Hello hello Vic. Oh no, I am sorry, I feel responsible for your supper. OK, lets think about this. First up, they are never going to be falling apart tender, but they should be tenderish to the points of a fork. you could cook them for up to two hours (gently, gently) and keep prodding. They need to relax for a while before you eat. I’m sure the slices were thin enough, my friend sitting here has suggested you also bash them a little with a meat pounder. I can tell you that they were all eaten – every one – and there were no complaints. The sauce was sopped up completely!!! I will do them again incorporating the suggestions. okay, a meal at Cesare al Caseleto is clearly a must ! Oh, delicious food for the tail end of winter. And I agree with another commenter — the sauce would be delicious on pasta. P.S. I love the word involtini. I can vouch for the sauce on pasta now (we had it today, I am on an involtini roll if you will pardon the dreadful pun). 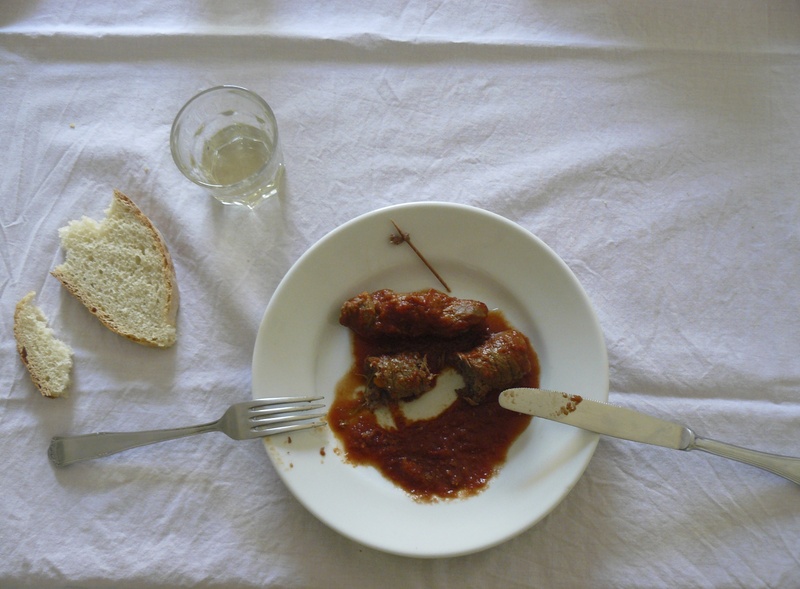 Have just read Luisa Weiss’ ode to beef rolls (hers stuffed with seasoned bread crumbs, damp with olive oil, and grilled over charcoal, in place of simmering in sauce), made during sojourns to Italy as a child, and now? This? I’ve never before craved involtini. Now, I cannot get them off of my mind. Probably, only one thing to do. I have been living in Italy for a long time and even lived in Rome for a brief period. I know and love Italian food, yet living in one part of the country, you forget how different the trattoria food is from one region to the next, if not even from one city to the next. I love involtini yet I rarely eat them here (and when I do they are usually made with cabbage leaves in restaurants). And most of the other dishes you mentioned from your lunch never make an appearance on a Milanese table in a trattoria: the cicoria ripassata, the vignarola… you reminded me of a whole series of traditional dishes I had not thought about it a long time. It has only been eight years but I have lived and travelled hard enough to know (as you clearly do ) how extraordinarily regional italain food is. I love the way trattria stay so true to local roots – I find it reassuring in a world gone mad. I am long overdue a trip to Milan. Let me know if you come and we can have some Milanese trattoria food. Third time was a charm. I took your friend’s advice and and did bash the meat a little. This is delicious, a real keeper! Thanks.